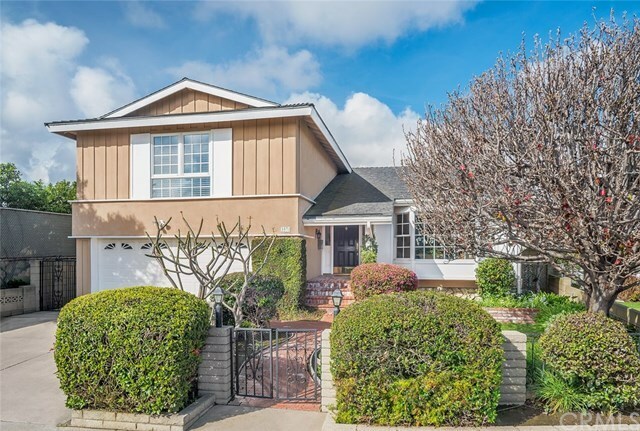 Welcome to this Fantastic Tri-level home located in the prestigious College Park East neighborhood of Seal Beach and in the Highly Sought After and Award Winning Los Alamitos School District! 2,289 SF of interior living space and a Fabulous Pool and Spa! At the front entry is the formal living room that features a picturesque bay window, an open and spacious living room with natural light, wood flooring, and custom Crown Moldings. Cozy up in the spacious family room, complete with a gas/wood burning fireplace, wood flooring, and a large slider that offers a view of the Entertainers delight back yard, patio and pool. The spacious kitchen has recessed lighting and plenty of storage and in kitchen dining area and overlooks the backyard paradise. The generous sized master, includes a walk in closet and 5 additional closets for storage space! 2 additional large bedrooms with electric retractable awnings on the opposite side of the home and a full bath with granite counter tops. Additional amenities include, ceiling fans, private fenced back yard, Copper plumbing throughout, new smooth style ceilings, force air heating and air conditioning, attached 2 car garage with direct access to the inside laundry room with lots of storage. Close to shopping, dining and conveniently located next to Bluebell Park, Seal Beach Tennis Center, transportation, Old Ranch Country Club and beaches are just a short distance away. Live, Play and Entertain in your dream home! This one won't last! Directions: Seal Beach Blvd to Lampson, right on Basswood, right on Aster to Almond, Left on Bluebell St.